Your body deserves the best things. Stop treating yourself bad with some cheap exercise equipment that can frustrate and prevent you from getting your ideal body shape, or simply maintaining a healthy lifestyle. 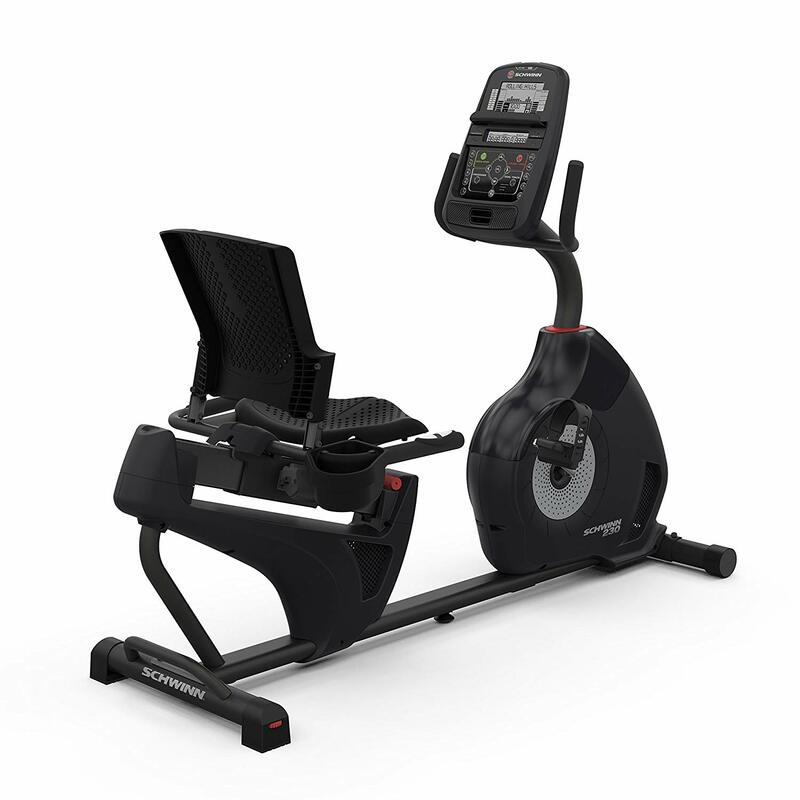 Schwinn 230 Recumbent Bike is one of the greatest gifts you can give yourself. 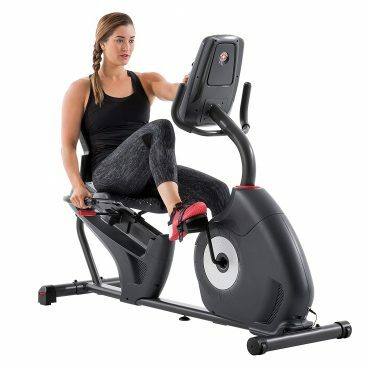 It costs double more than the cheapest exercise bikes on the market that could possibly give you acceptable exercise experience (I have reviewed one here: [1 – Marcy ME 709 Review]). However, it’s worth it. In this review, I will show you why. Founded on October 22, 1895, in Chicago by Ignaz Schwinn and Adolph Arnold, Schwinn Fitness is the oldest high-quality bike manufacturer in the US. More than 100 years of experience in making bikes gives Schwinn Fitness a great understanding of what customer need. And Schwinn Fitness keep maintaining its creative innovation to enrich people’s lives. 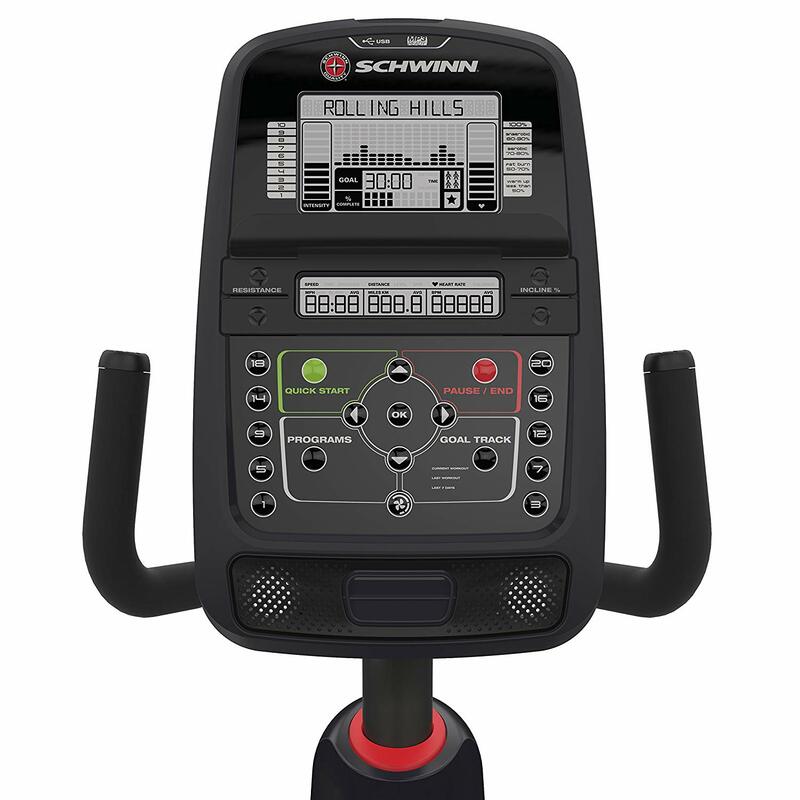 Besides recumbent bikes, Schwinn also produces upright bikes, classic cruiser, airdyne bikes, ellipticals and treadmills. All have a smart design and integrated technology. You can trust the exceptional quality of Schwinn’s products. 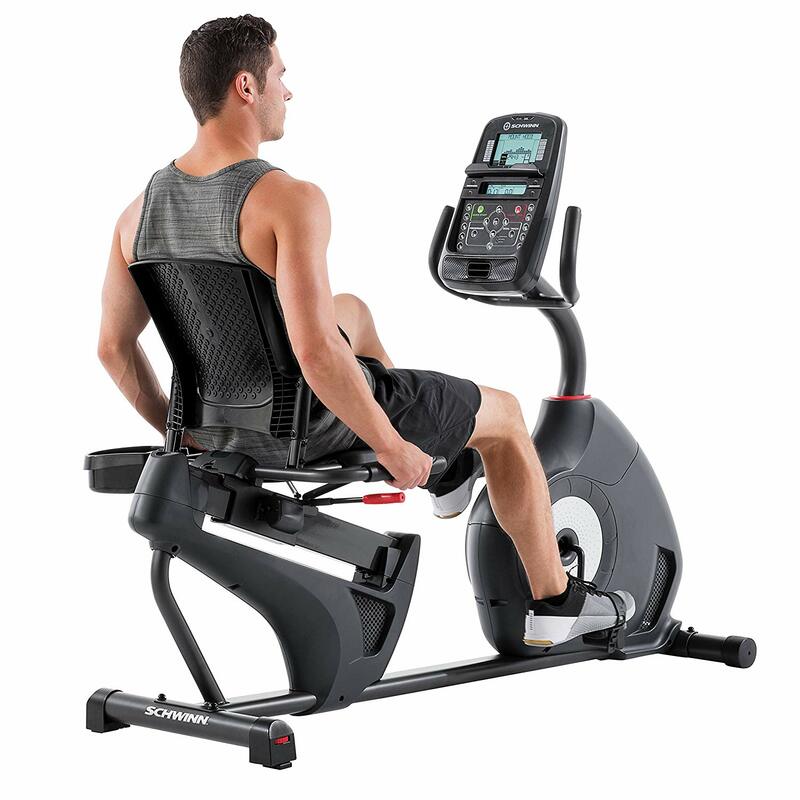 As the name ‘Schwinn 230 Recumbent Bike’, this is a recumbent bike (among other types, such as upright Stationary bike, indoor Cycling Bike, dual-action Stationary Bike). The recumbent bike is the most comfortable and easy type of exercise bikes. This type of bike is perfect for blood flow, cardiovascular and lower body workout, and is the best choice for those want to maintain a healthy lifestyle, or for physical rehabilitation and physical therapy. The recumbent bike is designed like a chair with pedals in front of the seat. This design makes it easy on your back and knees, making sure that you will feel enjoyable and won’t have any injury while practicing. The design is a strength of Schwinn 230. It looks high-finished in all-black appearance with some red highlights. Schwinn 230 is quite small that is suitable for a small apartment. Indeed, the dimension is 64L x 27.7W x 49.9H inches, which means it will take only 1772.8 square inches of your floor. It can be assembled. However, as the weight is quite heavy (81.6 lbs), you will not want to disassemble it each time after using. In fact, you might need a hand to unbox and assemble it. So, choose a fixed place in your house to put it. The bike can be used as a decoration because its high-quality, chrome-plated seat tube looks good in any room in the house. In return, this heavy weight will give you a secure and smooth feeling when exercising, and Schwinn 230 can carry a 300 lbs (up to 400 lbs) user. – Step through design with grab handles for easy on/off. One little thing showing how Schwinn understand its customer is the user-friendly design that enables you to easily get on and off the bike without having to step over a high seat rail. – Two integrated levellers for a solid workout platform and oversized crossbar tubing for added stability. These oversized stabilizers provide rock-solid steadiness. – Transport wheels allow for easy movement from room to room. Transport wheels give you the versatility to move your workouts to the family room while watching the kids or the den while enjoying your favourite tv program. – Vented seat bottom with contoured leg area for comfort. Normally, the seat of a recumbent bike has cushions for cosy feeling or has holes for airflow, which makes you have to choose. 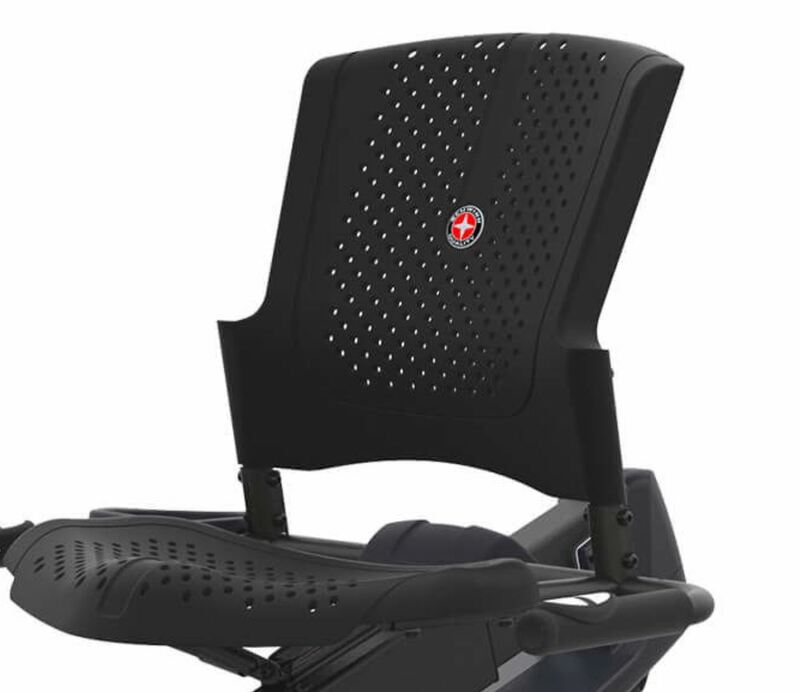 However, Schwinn 230 is featured a vented ergonomic wide seat with contoured leg area that offers you not only comfort and support of a cushioned seat but also freshening of a vented seat. – Large vented seat back with lumbar support for comfort and cooling. Lumbar support can be adjusted for improved lower back support. – A slider seat rail system has an easy to operate lever system. Seat slider mechanism ensures optimum seat height and fore/aft adjustment. The handlebar behind the seat gives your hand something to hold, securing your body, and lowering the pressure on your shoulder and back, when you are riding. It is ergonomically design for a relaxed position, and a integrated hand-grip for heart rate monitoring. Handlebar slider mechanism contributes to an ideal user interface position. Schwinn 230 pedals are designed with adjustable foot straps in order to provide proper alignment for efficient pedalling with ultimate control. They also enhance the comfort of user’s foot, ensuring the practising experience is smooth and rhythmic. An advanced console with two LCD windows is always in your sight when exercising to monitor workout metrics. It is tilt-adjustable for a customizable viewing angle to accommodate various workout environments, positions and intensities. This console gives you real-time important information, such as program selection, resistance level, interval time, time, RPM, Watts, Distance and heart rate. You can easily change your practice program, speed and resistance level using the console. 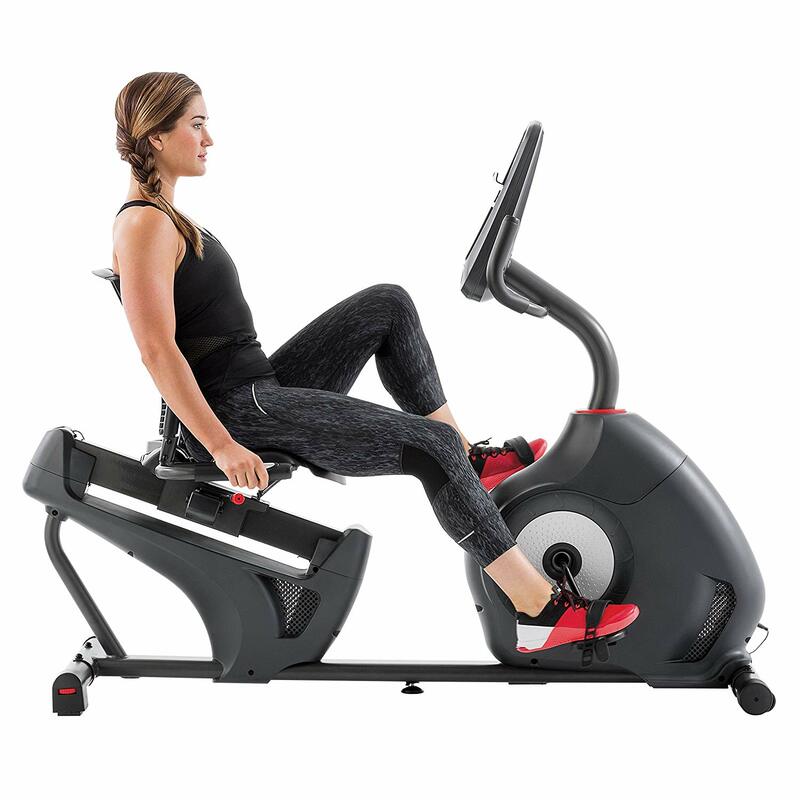 When you get used to this console and discover various functions, you will find this bike’s 22 programs and 16 levels of resistance are interesting that will keep you motivated and help you achieve your fitness goals. This console feature USB charging port and MP3 input, which will let you pedal on to your favourite music through the console speaker. Through this USB port, you can upload your progress to many different fitness tracking apps, such as SchwinnConnect, MyFitnessPal, GoogleFit, Apple Health, Endomondo, MapMyRun, to track your goal. Furthermore, there are also three adjustable fans in this console, always available to keep you cool during intense workout periods. 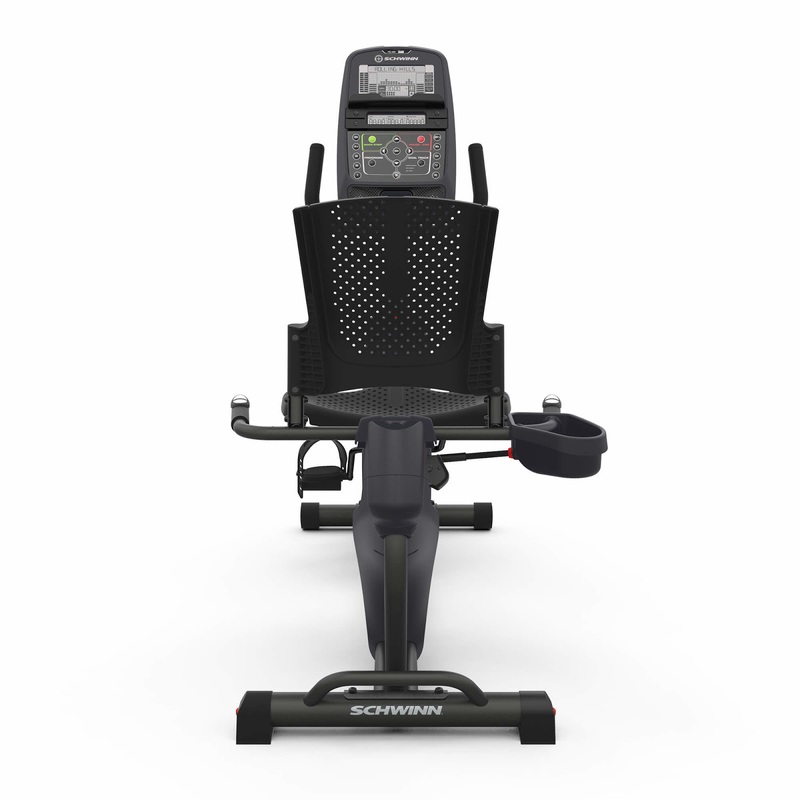 As a recumbent exercise bike, Schwinn 230 helps you keep fit while staying comfortable and motivated. Schwinn 230 workout programs offer you a great method to reduce fat, improve cardiovascular performance and increase stamina. Here I’m now going to share some of my experience using this bike. More than 100 years of experience is the thing. They did it outstandingly. Its ergonomic design on the seat, the handlebar, the shape give the user maximized comfort when sitting. It is like that you are sitting on your sweet chair at home, leaning your back on the seat back, holding the handlebar to lift your body up. The lumbar support and ergonomic handlebar will help you sit comfortably, maintaining good posture that is really good for your spine and shoulders, as well as keep you full of energy. As the pedals are in front of you, you will straighten your legs, together with the lifted upper body, making a proper posture when exercising. By maintaining this posture, your arms, knees, shoulders and back will be supported, and you can protect you from knee injuries, shoulder and arm pains, as well as diseases of the vertebrae. Furthermore, keeping this posture without pedalling is enough to give you an exercise, just like a simple yoga pose. And when pedalling, your legs need to work harder without the support of trunk and upper body movement, which is great for leg-workout, or physical rehabilitation/physical therapy. Thanks to the USB port, you can exercising while enjoying your favourite music. 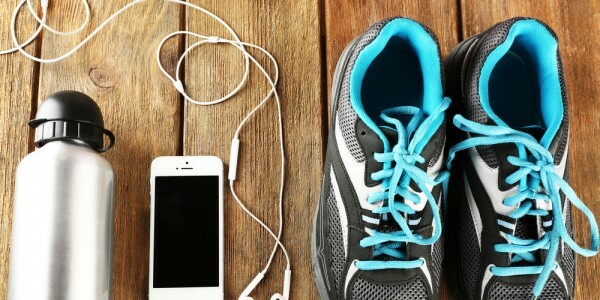 As many know that music can really benefit your workout. Music can not only boost your mood, push your performance, help you keep pace but also can be used for recovery. The beat is like a signal to your brain that keeps you maintaining a rhythm. You might pedal for hours without notice that. 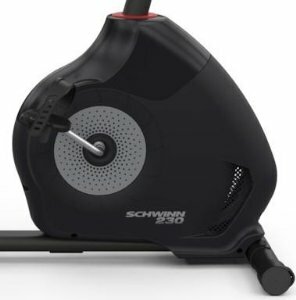 At the heart of Schwinn 230 is a heavy flywheel creating resistance and momentum, thus, when you start pedalling, your first several rotations are extremely hard. However, the more you practice the more smooth and easier the rotations become, even, you need to generate a force to slow down the speed. This resistance and momentum make it interesting and effective when practising, that make you don’t want to stop once started. 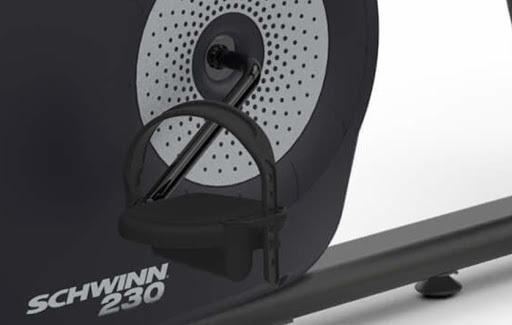 To create the resistance, Schwinn 230 has a magnetic resistance mechanism. Comparing with another resistance mechanism – direct-contact resistance – the magnetic resistance mechanism has much more advantages. With all of the predecessor’s disadvantages, when the magnetic resistance mechanism was invented, it has completely dominated the market. This system uses electromagnetic induction to provide the resistance, just like the Shinkansen (super fast train, also be known as bullet train) of Japan. So, this kind of mechanism operates smooth and quiet. The components have the longer life which will save some costs for you. Moreover, you can easily adjust the level of resistance at a push of a button. In fact, Schwinn armed Schwinn 230 with 16 levels of resistance – what an amazing number! And the most important thing, due to the rock-solid design, no matter how heavy you are and how fast you ride, there is no shaking at all. Completely smooth and stable! As mentioned above, the advanced resistance system and the rock-solid design make sure there is no squeak, no thumb during your practising. All is the smooth sound of a well-oil machine. When practising hard, of course, you will sweat and feel hot. But, the holes in the seat and the three fans in the console produce air circulation. And you won’t feel uncomfortable and exhausted by muggy air. You will feel easy on your Back, shoulders, and knees due to the proper sitting posture and body supporting design mentioned in section 4.1 above. Your ankles are also secured due to the foot straps that ensure your ankles are in proper position and alignment. Many have reviewed on Amazon that even though they have bad joints or being injured, they have no problem using this recumbent bike. The bike also helps them to improve their joints and health. The console table is super awesome. Ignore using this console to its all potential is a crime. Here are some modes and programs you might want to give a try. In this program, you will manually adjust the resistance level during your workout to make the program easier or more challenging. It is just simple as entering some information including level of resistance, time, and weight. During the workout, you can easily change the resistance level or Stop/Pause the section whenever you want. The Calorie Goal feature lets you select a number of Calories you would like to burn during your workout. After choosing “calorie goal”, you need to enter the number of calories you want to burn (from 10 to 990). Then, the console will offer you to choose a profile program. Select a program and start to workout. It is quite a fun workout process when counting down from the entered number of calories to 0. This will keep you motivated. To monitor your heart rate, you have to grip the grip heart rate sensors located on the handlebars by both hands. Then, look for the flashing “heart” icon and pulse rate located on the lower right portion of the LCD display. This tool is limited when it do not auto measure your weight and height, but you have to enter it by yourself. And the console will simply do a division to give you your BMI score, and it also shows your ideal weight range for your height. Recovery Test shows how quickly your heart recovers from an exercise state to a restful state. Improved recovery is an indicator of increasing fitness. To take this test, you have to press the “Recovery” button, and the console must be displaying your heart rate. The console will show “01:00 STOP” and the time will begin to count down. Stop pedalling, but keep gripping the heart rate sensors. When the clock reaches 00:00, the console will calculate your recovery score by minus your heart rate at 1:00 by your heart rate at 00:00. The higher this number is (but not too high), the better your health is. When you complete a program, the Results Mode will automatically display and show your basic workout statistics. You can also manually press “Results Mode” button to end your workout section and see your results by far. HEART RATE: showing Average Heart Rate. Note: The console will automatically shut down after 2 minutes of inactive (pedalling or input the console). You can choose the information mode between English measurement units (miles, pounds, inches) and metric measurement units (kilometers, kilograms, centimeters). This bike uses electric power. Plug it into any standard electrical wall outlet on a 110V-120V circuit. One 90-240V, 50-60Hz adapter included AC power adapter is included in the package. This price is higher than popular market segment exercise bikes. However, it is reasonable due to its quality and functions. Schwinn 230 has a good warranty, including 10 years warranty for frame, 2 years warranty for mechanical, 1 year warranty for electrical and 90 day warranty for labor. That’s the warranty plan of the manufacturer, you can also buy added protection plan from the retailer if you want. However, I think the manufacturer plan is enough. Schwinn 230 Recumbent Bike has a high Amazon product’s star ratings. This index uses an AI model instead of a raw data average to give customers better information. In particular, it considers the factors like the age of a review, helpfulness votes by customers and whether the reviews are from verified purchases, to calculate the final score. So, basically, this product is high-rated by users. On the terms of positive feedback, there are a lot, especially for the vented seat, the adjustability, the rock-solid stability, the great console, its easiness on joints and conformity with oldsters and the injured. In contrast, there are also some low rating with a bad feedback, mostly because of the quality control process. For example, the fans are not working, the console is broken. These problems are easy to fix as that they offer replacements for defective products. However, there are some problems you have to consider. Such as some say that this bike is small if you are a tall person (above 6’03”). Also, one has given this bike 1-star rating because he had to assemble by himself. If you are fine with these problems, this bike is a great choice. – Great ergonomic design that gives you a comfortable posture. – Lots of workout options. – Excellent experience when pedalling and monitoring workout parameters. – Smooth, quiet, fan feels good when sweating. – Small for someone 6’03”. – Have to assemble the bike by yourself. – Not so easy to assemble and disassemble. – Only 2 User profiles. It is a problem if you share this bike with 3 or more people, and want to save your workout results and progress. – The seat is well designed for comfort, however, it is plastic, thus, it is not as cozy as a cushioned one. – Want to maintain a healthy lifestyle. – Want to improve cardiovascular health. – Want an interesting and easy method to keep fit. – Want a physical rehabilitation/physical therapy treatment. – Have injured joints and spine.